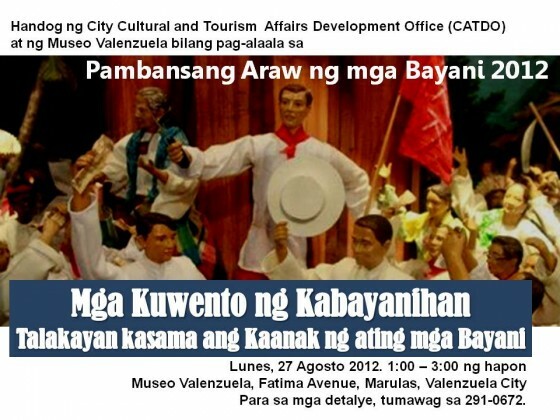 In line with the celebration of National Heroes Day and History Month, the City Government of Valenzuela and Museo Valenzuela Foundation will hold a forum entitled “MGA KUWENTO NG KABAYANIHAN: Talakayan kasama ang Kaanak ng ating mga Bayani” on Monday, August 27 at 1:00-3:00 p.m. at Museo Valenzuela, Marulas, Valenzuela City. Interesting anecdotes and inspiring stories about our heroes and reflections about nationhood will be shared and discussed in this forum with Ms. Gemma Cruz -Araneta, Ms. Amy Yulo, Arch. Arturo Valenzuela and other descendants of Filipino heroes. For details and confirmation of attendance, contact Jonathan Balsamo, curator of Museo Valenzuela at 291-0672, 09062020274 or thru email at jcbalsamo@valenzuela.gov.ph.